The time is soon approaching when Bill Rayburn will be traveling to ACU along with a team of three ladies who will be working with the ladies in Pangasinan to equip them to better teach their children. Bill will be teaching a course on the Book of Revelation for students at ACU. The ladies will conduct a two-day “teach the teachers” workshop for teachers of children’s Bible classes throughout the region. Following the workshop on Monday and Tuesday, the ladies will help the Philippine teachers conduct a three-day VBS for the children of the Bugallon Church of Christ and the surrounding area on Wednesday-Friday. Then on Saturday, each will be a featured speaker for a Ladies’ Day program. On Saturday, during the time the Ladies’ Day program is taking place, Bill will be engaged with preachers and church leaders from throughout Pangasinan in a discussion of issues facing the churches of Christ in the Philippines. 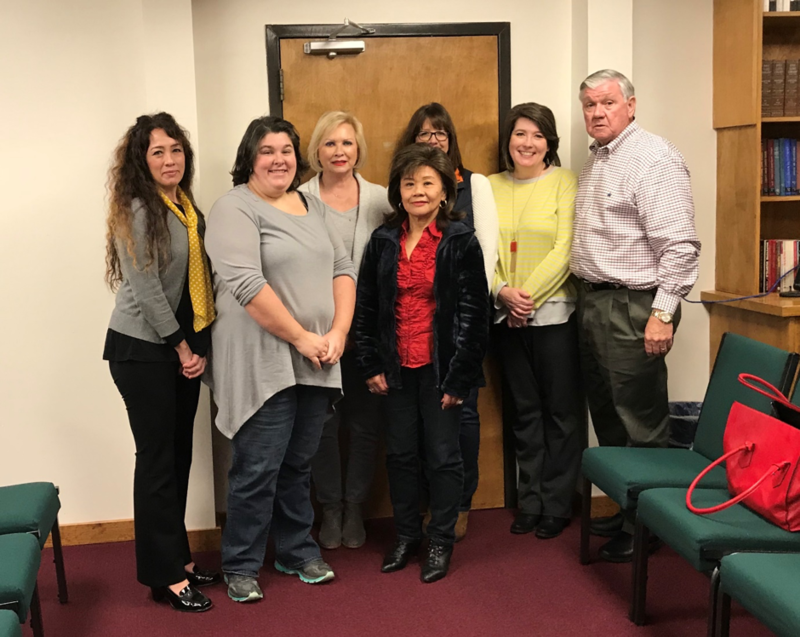 Pictured left to right, Kathleen Eiring, Lanice White, Brenda Rayburn, Anita Williams (in front), Jennifer Smith, Janie Gaither and Bill Rayburn. The team that will be traveling to the Philippines includes Bill Rayburn, Anita Williams, Kathleen Eiring from the Hoover Church of Christ in Hoover, AL and Lanice White from the Guin Church of Christ in Guin, AL. In addition to those going to the Philippines, there are others who have provided invaluable assistance by helping prepare materials for the VBS program. These ladies are Jennifer Smith, Janie Gaither, and Brenda Rayburn, all from the Hoover Church of Christ. The group will depart on April 12 and return home on April 23.